If you have royal blue dress shoes that you want to wear. 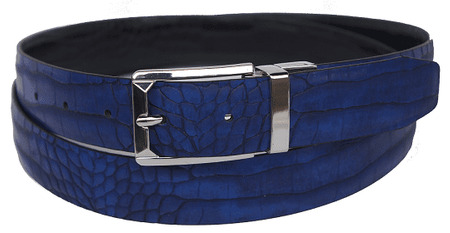 Do it up right and wear a matching color royal blue crocodile print belt by Bruno. These mens dress belts feature style that will get you noticed and they are reversible to black for convenience. One size fits all up to size 44 waist. Give the party people something to gawk at by wearing a Dinner Jacket that will stop the party.